The Old England has great views of Lake Windermere, day or night. Thinking positive and being healthy is the mantra by which many of us have started 2018. And the beautiful setting of Bowness –on-Windermere is just the place to go for that mid January pep up. 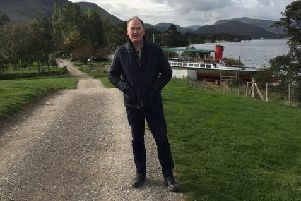 The Lake District has always been a wonderful spot to visit and now it has been given UNESCO World Heritage status, there are even more reasons to go. Flossie and Ruaridh's River Nile team could not crack The Pharaohs Curse. Persuading husband Kenny, children Ruaridh (10) and Flossie (8) that is was time to leave the sofa and put our resolutions into action was always going to be tough, but with the promise of some fun, we were soon on our way to the Macdonald Old England Hotel, which lies in the heart of the town and has spectacular views of the lake. Part of the building has just undergone a £250,000 upgrade and the 106 luxury bedrooms, impressive dining and relaxing lounges, as well as a modern spa and gym, mean it is a great place to visit. And with friendly, attentive staff led by new energetic manager Karen Irving, all was going to be perfect. The good news for us was that hotel has started 2018 off with a new look breakfast menu which features the best of British produce including dry cured bacon, red-tractor certified sausages or for the more adventurous Stornoway black pudding and Scottish smoked haddock, salmon and kippers. High energy granola bars and freshly baked muesli muffins are also a great way to start the day, along with chemical free jams and preserves and a special gluten free zone. Beautiful Lakeland stone welcomes you to The Old England. And the evening menu served in the delightful dining room with great views, is equally impressive with hearty soup and smoked salmon starters followed by tender lamb and the fish of the day, proving to be just the ticket. A nice touch is the palate cleansing mango sorbet and fish ball nibbles in between courses and all rounded off with lovely desserts such as egg custard tart and raspberry sorbet and artisan cheeses. Children are spoilt too, with good quality fun food such as roast chicken dinners and bangers and mash. Suitably fed and relaxed meant we were in the right mindset to actually challenge our brains to some work. We headed to nearby Newby Bridge and Lakeland Village which is home to Cliffhanger Rooms and the Escape Rooms live adventure games. This gem of an attraction is housed in a beautiful traditional stone barn and is fun from the moment you enter. Ruaridh and Flossie squealed with delight when they were encouraged to graffiti the walls with their names and messages and then it was down to the serious business of coming up with a team name. There are three games, The Pharoah’s Curse, Bank Vault Heist and The Haunted Pirate Ship to choose from and feeling exotic we went for the Egyptian one, where a pyramid has just been discovered, which is believed to be the resting place of a long-forgotten Pharaoh. Rumours of treasure and money coming out of our ears encouraged us to take on the role of archaeologists and .tackle the mission to reach the inner tomb and find out the identity of the mysterious Egyptian king. Calling ourselves The River Nile we were confident we could crack the challenge set to us by the Pharaoh’s wife Helen and unlock the treasure. The games allow you 60 minutes to solve the puzzle and you are given only three clues by Helen, who is hidden in another room, watching your every move via camera. Children’s brains work differently from adults and Kenny and I had opted to take a back seat to let Ruaridh and Flossie take charge. And it was great to see them so excited and determined to win the challenge. Unfortunately for us, their clue solving skills were not quite as good as we thought (although Helen was impressed with their Egyptian dance moves) and before we knew it, the time had run out and the identity of the king remained a secret for another day. All that hard work meant we were hungry again. But we were determined to stick to our resolution, so out came the Japan Centre’s Pop Culture snack box. With exotic treats from the Far East, this is a great alternative to convince the children to lay off the unhealthy stuff. It can be delivered every month to your house and it is great fun working out what is inside each colourful pack. But the best thing is, it helps keep that New Year resolution going for a little longer than usual! Activities: There is lots to see and do in this area, but the winter months can be unpredictable weather wise, so a visit to Cliffhanger Rooms, Lakeland Village, Newby Bridge, is a must. Here you can enjoy exciting, adventurous and interactive Escape Rooms adventure games, choosing from The Pharaohs Curse, Bank Vault Heist and The Haunted Pirate Ship. It’s great fun for all the family and really gets the brain going!